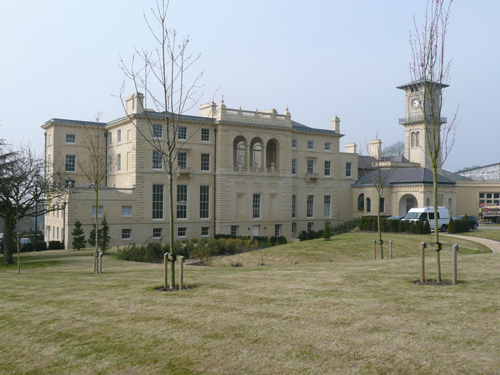 Bentley Priory was originally built in 1766 and was significantly extended in 1788, by Sir John Soane, for John Hamilton, 1st Marquess of Abercorn. As a result of his influence the Priory soon became a rendezvous for many political and literary notables. Visitors included statesmen such as Pitt, Wellington, Canning, the Lords Liverpool and Sidmouth and the poets William Wordsworth, Thomas Moore, Thomas Campbell and Sir Walter Scott. Sir William and Lady Emma Hamilton and actors Mrs Sarah Siddons and John Kemble were also attracted to the beautiful setting. The Priory was then hardly used until bought by Sir John Kelk in 1863. He was an eminent engineer and builder, notable amongst other things as the contractor for the Albert Memorial. 2 He added a picture gallery, a library, the clock tower, and orangery, conservatories, a cedar garden and a deer park. In its heyday the estate boasted 20 gardeners. 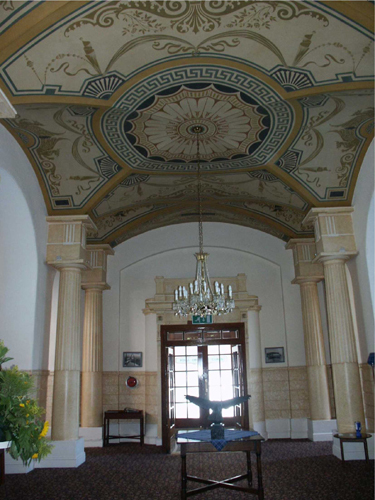 In 1882 the house was bought by Mr Frederick Gordon, of Gordon Hotels, who converted it into a hotel. As access to the hotel from London was not ideal Gordon had the railway line extended from Harrow to Stanmore for the convenience of his guests. It seems however that the hotel was not a success so the Gordons and their 11 children moved into the house until his death in 1908. The Priory changed hands again and became a girls’ school, however this failed during the financial depression and closed at the end of 1924. In 1926 the Priory building and 40 acres were sold to the Air Ministry and became the base for Inland Area (Training Command), part of the organisation of the Air Defence of Great Britain (ADGB). This was dissolved in 1936 when it became RAF Fighter Command, with Air Marshal Sir Hugh Dowding as its first Air Officer Commanding. During the Second World War the building suffered many changes, with the present Ante Room and Ladies Room being converted into the Operations Room and the Filter Room. 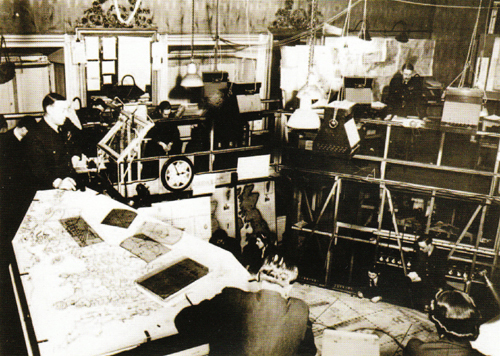 These two rooms were the essential elements of the Command, Control and Communications system which became the cornerstone of the Air Defence System. This gave controllers the best chance of responding to incoming raids by scrambling squadrons to intercept them before they could reach their targets. After the war the Priory remained the headquarters of Fighter Command, before this was amalgamated with the other operational commands to form Strike Command. In 1947 a fire destroyed the rooms above the Ante Room and serious dry rot was discovered some years later. These were dealt with, but more bad luck was to follow with another fire in June 1979, which devastated most of the main staircase and the Dowding Room. 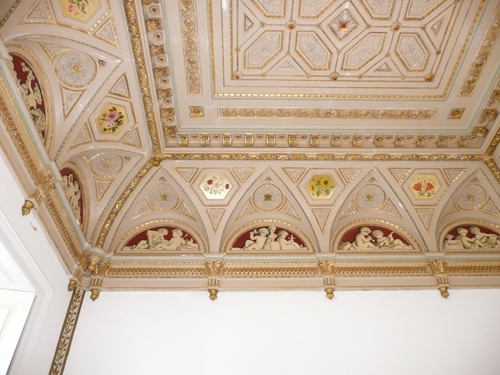 Throughout this time the entrance hall designed by Sir John Soane survived intact, although an intricate patterned design on the ceiling was revealed during the tidying-up process. It has subsequently been bought for redevelopment. A very good history can be seen on the developer’s website. I was originally commissioned to prepare a rationale for the redecoration of the Soane areas of the house when the RAF occupied it. However, I have twice since been asked for advice on the treatment of various areas and am currently working on the entrance hall. 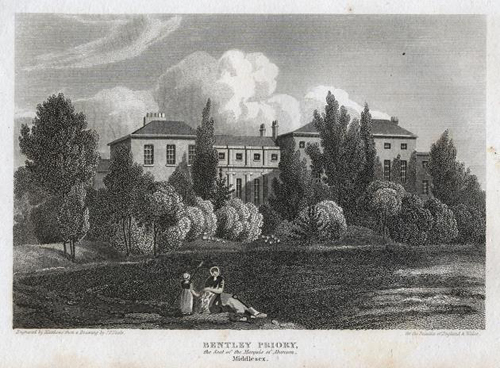 Here is a link to the Soane Museum’s holdings on Bentley Priory. 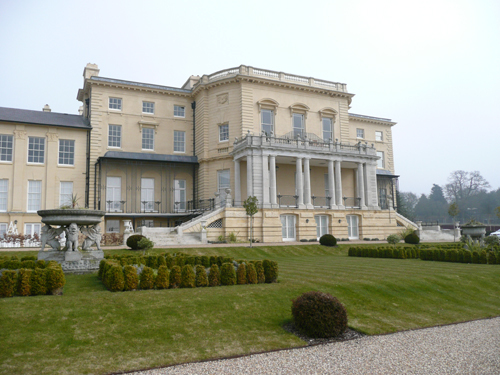 I have also found myself working on a London house that once beloned to James Hamilton, 7th Earl of Abercorn. Much of this has been taken from Flt Lt K Winks. An Illustrated History of RAF Bentley Priory. RAF. n.d.
1 The ceiling was added along with a marble chimneypiece with the Queen’s initials at some stage between 1849 and 1895 when the house was put up for sale. 2 He was also the builder of 13-15 Princes Gate and 18 St James’s Square, two of my other projects.